I'm one of those people who can't stand to see a messy email inbox, desktop, or online bookmarks. It's strange because I'm not that organized in real life, but remarkably so online. I love grouping everything in folders and I've just about died when I've caught a glimpse of friends' inboxes that have something like 200 unread emails. Ack! I've got so many recipes bookmarked everywhere that, as well organized as they may be, keep falling to the wayside when I look to make something new. There are just too many great recipes and ideas out there. Recently as part of my spring cleaning I've been trying to go through and finally try/adapt the recipes I've saved for years. This is one I've been coveting for two years now. It makes me feel so good to remove the bookmarks, slowly but surely! For Easter each year, I like to put little macaron bunny feet on cupcakes. 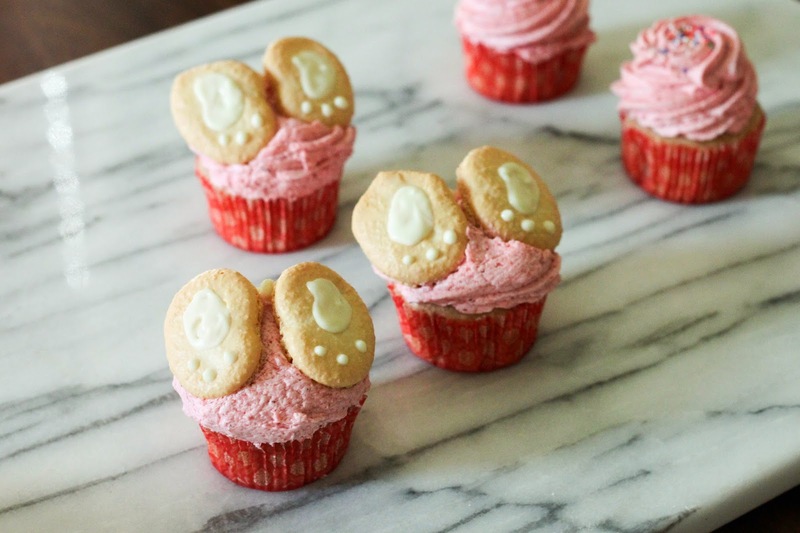 It gives the effect of a bunny headfirst in a cupcake with little tail and feet sticking out. It's so simple but so cute. This year I made strawberry cupcakes for a dinner party and added the feet to them. 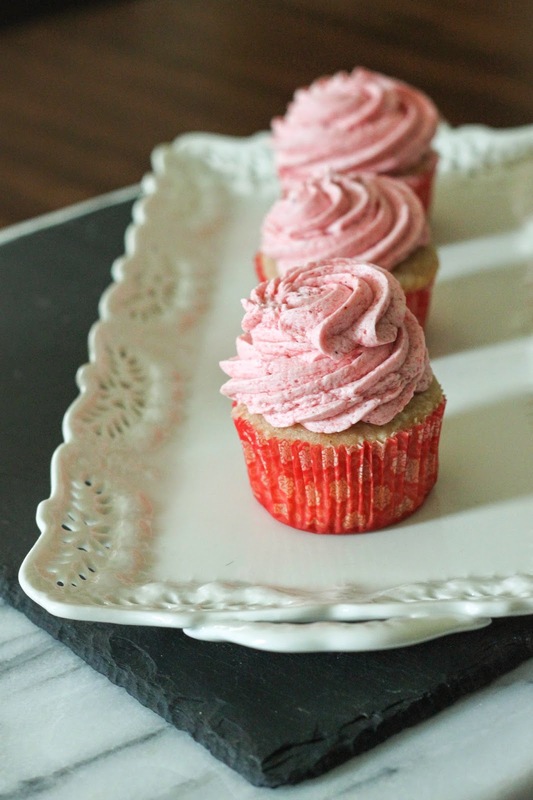 These cupcakes will certainly turn you into a strawberry lover even if you didn't like them before. I cooked the puree down to a paste and put it in both the cupcakes and the frosting. 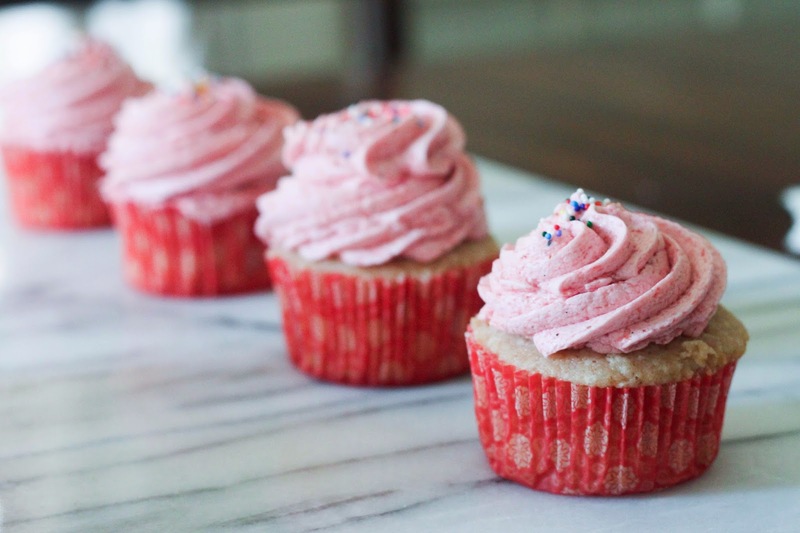 The cupcakes are light and moist but let's be real--the cake is pretty much a vehicle for this fantastic frosting. It's one of the lightest and most delicious frostings you'll ever have. It uses a choux-like paste of milk and flour that gives it the consistency of a sturdy whipped cream. I'm just warning you now, you'll be dipping your finger in the frosting bowl a lot. 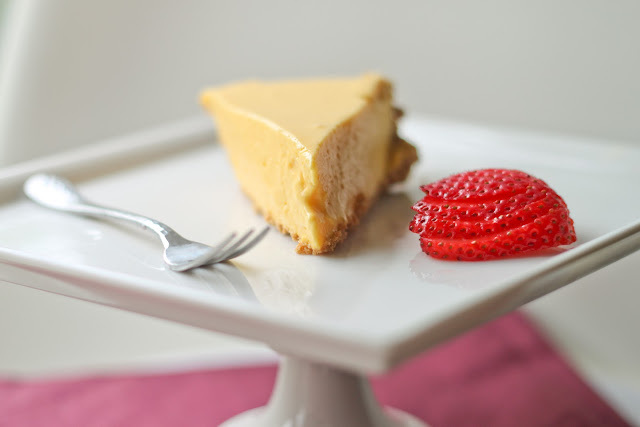 Add sour cream, egg yolks, strawberry puree, and vanilla. If you want it pinker, add some pink gel food coloring. Add the dry ingredients to the liquid ingredients. Fill lined cupcake molds 2/3 full. Bake for 15-17 minutes, or until a toothpick comes out with just a little bit of crumb. No crumb at all means it's probably over-baked. *This will take forever to make without a stand mixer, although not impossible! In a small saucepan, whisk the flour and milk together over medium-low heat until it becomes thick and resembles mashed potatoes. (If the flour is unsifted, you could have clumps in the frosting). Once combined and looking like a paste, let cool completely and then stir in vanilla. While the mixture is cooling, cream the butter and sugar in the stand mixer until light and fluffy. Add the flour/milk/vanilla mixture as well as the strawberry puree and beat for nearly 15 minutes until the sugar is completely dissolved and it resembles whipped cream. You may add small amounts of extra strawberry puree if you want a stronger strawberry flavor, but just keep in mind it could separate and take longer to come together. Slather on cupcakes or funnel directly into your mouth. Melted white chocolate melts or food writing markers to draw the paws. Beat the egg whites and sugar in a stand mixer gradually increasing the speed until the mixture is super thick and doesn't move. Turn off the mixer and fold in the almond meal and powdered sugar, using a spatula to combine. Turn the bowl as you fold, making sure to scrape from the bottom so that there are no streaks. Once folded, add in a little extra egg white (about 1.5 teaspoons) and fold it in until combined. The batter should be loose and spread a little. Place mixture in a piping bag with a round tip. Pipe on silpat or parchment paper holding the bag perpendicular to the sheet, and pipe ovals with a little dent on a side (kind of like a fat B). Try to keep them small so they don't take over the cupcake, and keep in mind they will spread slightly so leave space in between. Let them dry completely until they are dry to your touch (about 30 minutes to a couple of hours). Bake at 285 degrees F for about 16 minutes, rotating halfway through. Let cool completely and use the white chocolate or the food writers to draw paws. 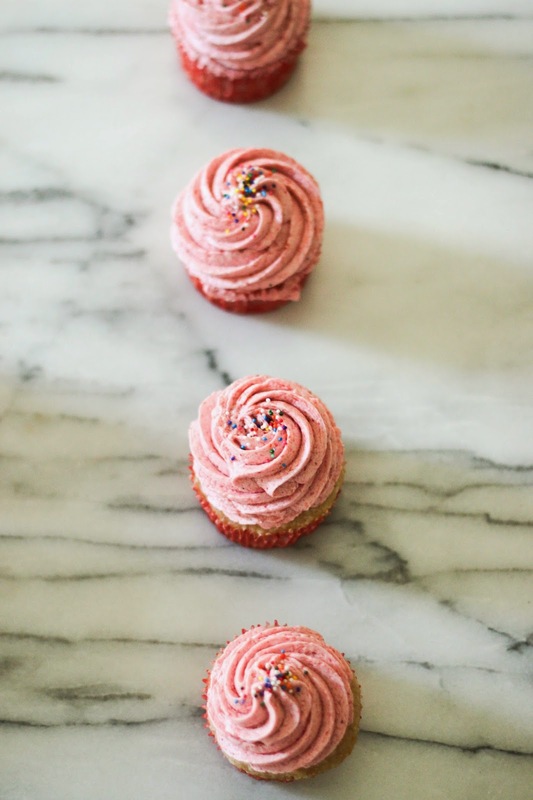 Place in the frosting on the cupcakes. Use extra frosting or white chocolate to place a little mound between the feet to look like a bunny's tail. Once assembled the cupcakes are best eaten the same day they're made.